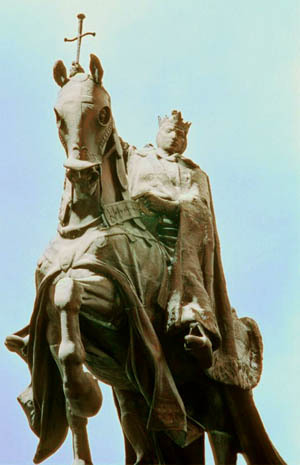 The Song of Roland was one of the most famous poems in the Middle Ages that celebrated honor. One spoke of honor, one sang of honor. In fact, I just quoted the first line of a poem of the 12th century. All the medieval poems are an extension of this word, and such poems about honor were so popular that they in large measure took the place of modern journalism. One spoke of honor to both the people and the barons, and all of them – nobles and villagers – would be attentive and reverent when honor was addressed. Honor is the first and major characteristic mark of that epoch. 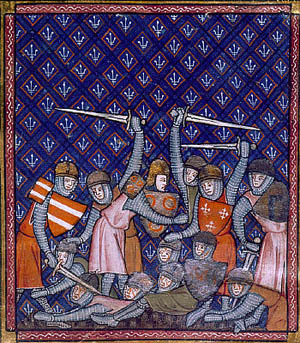 It is because of honor that to this day the Middle Ages dominates French History. For although the defining note of society has changed, although the Revolution has replaced honor with well-being as the social ideal, the remnants of that old honor is still what makes the heart of France beat on grand solemn days. Those remnants of honor are what sustain her soul in the lofty heights, what keeps us united when the modern theories try to make each one a harsh competitor with his neighbor. It is still those remnants that give us the strength to resist our external enemies and their best allies, the internal revolutionaries. To have created this notion of honor is not only a glory for Medieval France, but it is also a service to the fatherland. Medieval France created the notion of honor as a master sculptor molds an admirable statue from the remains of this or that material. For the human conscience and the heroes of Antiquity furnished Catholicism with bits and pieces of a beautiful, but incomplete model. Given that honor is the continuous sacrifice of the lower human instincts to man’s highest sentiments, only Christianity could make it a personal habit, a way of being. Only a society docile to Christianity could impose it as a general ideal. The insistence of the Middle Ages on preaching about honor and showing its sublime as well as practical aspects, on venerating and admiring it and sacrificing everything for it, made honor a new instinct. Such instinct raised the small person to be a great person, and the great person to be a hero. Honor had a daughter, fidelity, from whom chivalry was born. It was a fidelity – only glimpsed in Antiquity – that would endure unto death, unto personal ruin, unto the sacrifice of one’s dearest sentiments! It was not the fidelity of a Regulus, whose gesture caused astonishment to his contemporaries. (1) It was not the fidelity to the Roman emperors who divinized themselves as if to provide an excuse for such fidelity, and who would arbitrarily behead their subjects showing how that fidelity was not balanced. The medieval fidelity was the fidelity transformed into a daily, natural heroism, once again, an instinctive heroism. It was a fidelity docile to even the most difficult duty. It was a fidelity to the oath in face of anything – even the most despicable or hated thing – that might happen to the man bound by that oath. Honor, therefore, elevated fidelity even to martyrdom, helped mere bravery become heroism, and taught disinterest to not fear misery. To truly understand this honor, we would need to analyze each line that History has left us about St. Louis IX. This would be the way to reconstruct the code of this honor, because the Holy King was the purest incarnation of honor. He had all the delicacies of this honor as well as its full force and equity. 1. Regulus was a Roman general taken prisoner by the Carthaginians in 255 BC. After two years in prison, he was sent to solicit peace from the Romans, promising that he would encourage the Romans to sue for peace or return to Carthage as a prisoner. Instead, he advised the Roman senate not to accept the Punic terms and continue to fight. Resisting strong persuasions from his friends and family, he insisted he had to return to Carthage, where he was supposedly tortured to death.